Our summer was derailed one Sunday night in the middle of August. I was in the kitchen getting a snack or drink & I heard the water pump shut off in the basement. Unless things are really quiet and you listen carefully, you don’t hear the pump running. The loudest noise it makes is the pressure switch turning on or off. Since it was quiet, I heard it shut off. About 5 minutes later, I heard it click back on. The thing was that everyone else was in bed & I hadn’t used any water. I went down to the basement and shut the pump off for the night. A few minutes later, I turned on the tap in the upstairs bathroom and only got air. I thought, “Well, this isn’t good.” On Monday, I took the cap off the well and checked for water with a flashlight and was somewhat relieved to see light reflecting back. I spent the entire day Monday trying to get the pump primed. I succeeded in getting about 15 gallons of quite dirty water but had no luck on getting the pump to hold it’s prime. On Tuesday I checked out the local rental places to see if I could rent a video camera to lower into the well to see what I was up against. The population is low enough here that there isn’t enough people to rent one on a frequent basis, so none of the rental shops had one. After a couple phone calls I found a plumber/well-drill company that had one. On Wednesday afternoon, the well/plumbing guys came by and lowered the camera into the well. The good thing that we saw was that we found there were several feet of water in the well. The not so good part was that the bottom of the well didn’t look like the bottom of a well. It looked like a pile of mud & rubble. Just below the bottom of the well casing there was a fair sized pocket that was quite a bit wider than the rest of the well. The casing only went about 10-12 feet into the ground. The guys said it looked like the well had collapsed. That sounded like what I saw. Dig out and replace the line between the house & well (and hope for the best). 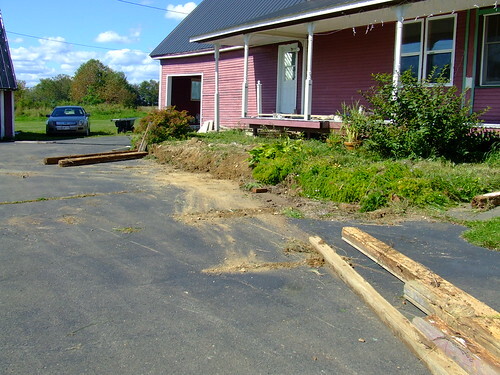 The catch was that the old well is inside a carriage house converted into a garage and the water line goes under about 30 feet of asphalt driveway. Even though it might be less expensive than drilling a new well, it wasn’t going to be pocket change. Andrea & I didn’t have much trouble opting for a new well. The prospect of doing the repair and then having the well collapse again in a year or two wasn’t worth whatever price difference there might be. I should emphasize temporary. Winter comes early in Canada. We’ve already had a couple nights where the temperatures have hovered around the freezing mark. We have had the pellet stove on a few times. Once I had the temporary water system hooked up, I scheduled having the well drilled this week. Today was that day. I’d never been up close on a well being drilled before so I wandered out a few times to check on how things were going & watch the whole process. Once the well casing was in, I was surprised at how fast the the drill went down and how much water came up. This particular drill was one that pounded (like a jackhammer but slower) while constantly spinning. It blew steam and compressed air through the bottom of the drill to blow the broken rock out the top of the well. Here’s a pic from the first hour before hitting bedrock . I also keep a rough track of the time. 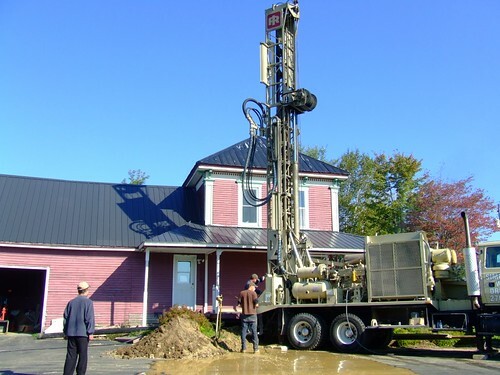 The first 30 feet of well & installing the well casing took about an hour & cost about $1500. After that, drilling ran at about $1700/hour (if you don’t include setup and take down time). The actual cost is based on the length of the casing needed & well depth vs time, so that’s just an interesting comparison. When the drill hits water, they don’t immediately stop. They drill down a bit further to ensure that there is a bit of a reservoir there. On my last trip out, there was a lot more water coming out of the top of the well than there had been in my previous trips. I took that as a good sign. The guy who owns the rig said he’d found water. Then, “I don’t think you’ll be able to pump this one dry.” Later he estimated the flow to be in the range of 12-15 (imperial) gallons per minute. I looked up pumps tonight and they seem to be in the range of 4-6 gallons per minute (so even if the pump ran constantly it couldn’t keep up). Even though this was an expensive day for us, it was memorable in another way. Well drilling is probably not a popular career choice. There isn’t a lot of fame or fortune in it. I could tell that he was really pleased with the result. Pleased in the sense that he had nailed it. If you’re going to work, you should want to do good work. And, rightly so, should be pleased when you do do good work.